Joseph Kabila addresses the nation on Wednesday, January 23, the day before Felix Tshisekedi will reportedly be inaugurated as president. Cape Town — As the inauguration of President-elect and opposition leader Felix Tshisekedi draws near, outgoing President Joseph Kabila called for "a grand coalition of all the progressive forces”. Kabila, in his first speech since the disputed December 30 presidential polls broadcast on state TV channel RTNC, said: "A coalition against the predatory forces that have come together and will always try to join forces to monopolise our natural resources." The opposition's Martin Fayulu lost a court appeal for a recount. 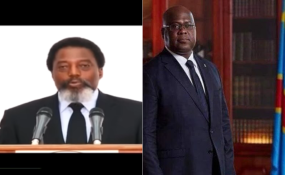 The outgoing leader congratulated Tshisekedi, saying he will hand over power "without regret or remorse", SABC reports. He is quoted as saying Tshisekedi "must be able to count on me whenever he wants and that the interest of the country requires". The president-elect's inauguration had been planned for January 22, 2019, but was then announced for today, January 24.